Welcome to my second update for the 2018-19 season!! Since I’ve last left you all, I’ve gone to Mount Hood for a second on-snow camp, water ramped for 4 more weeks, celebrated my 18th birthday, and completed my first cork 10s on snow!! Water Ramping a New Trick! I went into our second on-snow jump camp at Mt. Hood, at the end of July, with no expectations with regards to the cork 10 in mind — my biggest goals were focused on cleaning up several of my other jumps first and foremost (back lay, back full, cork 7). On the second day of jumping, though, there came a point where both my coach and I decided I was ready. After landing my first few on that first day, I was over the moon!! If you had told me a few months ago that I was going to do my first cork 10s on snow, I would have adamantly disagreed with you. I definitely did not expect to be consistently completing these on water ramps, let alone on snow! Upon returning from Mount Hood, I have continued to work on this jump! I’m really happy with how how my progress is going, as I feel that I am steadily putting myself in the position to have the potential to compete it at some point during this upcoming competition season!! If I do end up competing it, I will be the very first female to complete it in competition… That thought is pretty crazy for me, as I’ve always wanted to make my own mark on the sport, and this would be a huge way for me to do so beyond the expected norms of progression on the women’s side of mogul skiing! Beyond skiing, I’ve had the opportunity to spend some time with friends in Park City! One of my friends from my high school traveled out to Utah to visit me before she starts college at Duke this upcoming week!! (: I also celebrated my 18th birthday with some of my teammates up at Bloods Lake and Guardsman Pass (both of which are gorgeous spots to hike up atop Park City Resort) a few days ago! Up next for me is another week-long on-snow camp in Mount Hood, then back home for one last block of water ramping before a long camp on a full mogul course in Zermatt, Switzerland!!! 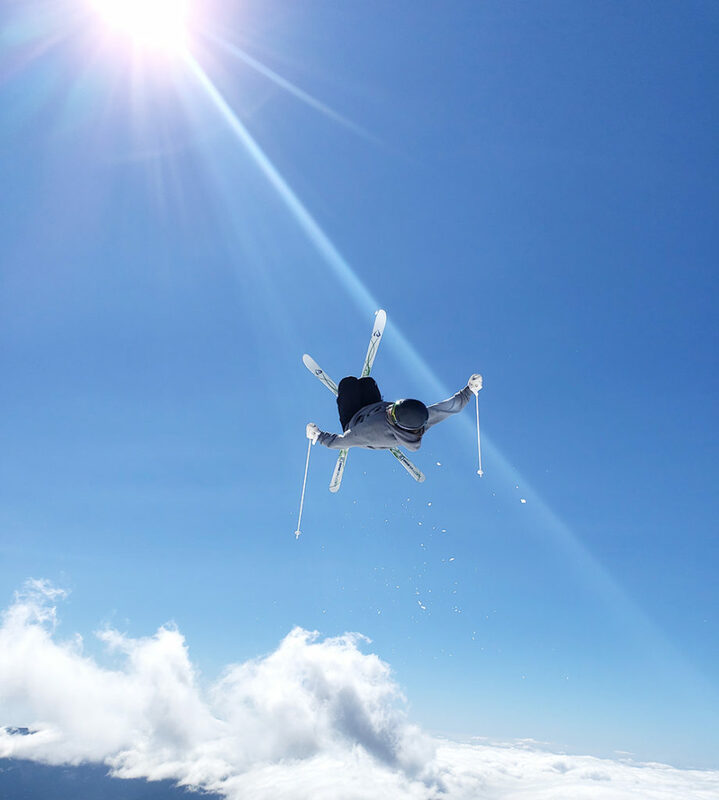 Sept 8th – Support the US Moguls Team! On September 8th, all of my teammates and I are hosting a fundraiser in Vail, Colorado to raise money for unfunded athletes on the US Moguls Team, and we would love to have your support!! The fundraiser in Colorado will be an opportunity for people to spend some time with all of the Moguls Team members at a cocktail party and help to support the team compete on World Cup this season! While there are some athletes on the US Moguls Team who are funded, the majority are not. On average, it costs each US Team athlete $30,000/year for training, equipment, travel and competitions. Finding ways to fund the competition season can take away from valuable training time during the months when we are not competing and traveling, causing unnecessary stress both with respect to performing at each event and funding your way to actually get to that event. Therefore, any support goes a long way to help each of us represent the US to the best of our abilities. To RSVP for the event or make a donation to the team, please contact: Jacquelyn.Luedtke@usskiandsnowboard.org and specify that your donation is for the US Mogul Team. Thank you! !